Longer Brewing Delivers More Caffeine: The longer hot water is in contact with coffee, the more caffeine it extracts. A French press steeps grounds for 4-6 minutes; with drip coffee, water drips through in about 3 minutes. Robustas Are Twice as Caffeinated as Arabicas: Coffee experts prefer Arabica beans because of their smooth taste. The Robusta variety is harsher, stronger in flavor, and usually less pricey; it’s often mixed into blends to boost impact or lower the price, but good quality espresso blends include robusta for its lovely crema (foam). Lighter Roasts Retain More Caffeine: Roasting destroys some caffeine content. Longer, darker roasts actually contain less caffeine than light or “blonde” roasts. Espresso is made with dark roasted beans, giving it less caffeine than one would expect. Hotter Water Extracts More Caffeine: Experts recommend 195-205 degrees, and the higher temperatures extract more caffeine than lower ones. Water boils at 212 degrees F, but that temperature can produce a harsh tasting brew. Finer Grinds Yield More Caffeine: Finer grinds expose more of the coffee bean to water than course grinds, so more caffeine is extracted more quickly. Despite a longer brewing time, a French press using the customary coarse grounds yields less caffeine than drip brewing with fine grounds. Burr grinders create rougher surfaces, and yield more caffeine, than blade grinders. More Coffee Grounds Produce More Caffeine: This is logical. The greater volume of coffee grounds, the more caffeine is extracted, with a stronger flavor. So obviously, the amount of caffeine in coffee (and tea as well) can vary considerably. But as a rule of thumb, I use 100 mg per 8-ounce cup of home-brewed coffee. (Starbucks lists a 16-ounce grande coffee at 330 mg caffeine.) Tea typically ranges from 30-80 mg per cup, so my rule of thumb is 50 mg caffeine per cup of black tea, and 25 mg for green tea. 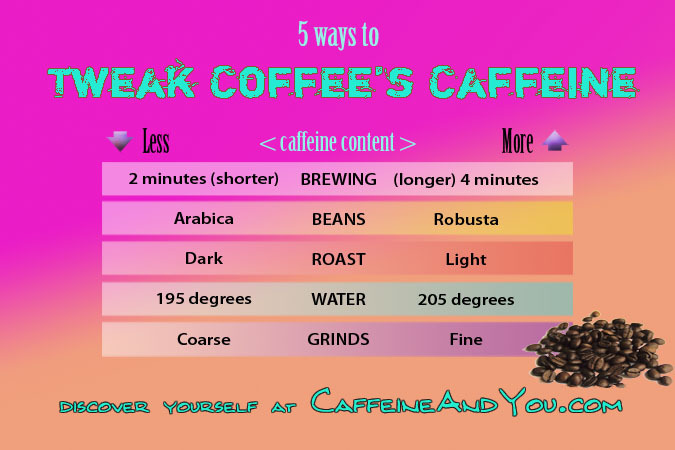 Calculate Your Caffeine – Infographic compares caffeine per ounce, in coffee, tea, energy drinks and more.